Very usefull tool for proprioceptive and equilibrium exercise after an injury or to increase athletic performance. 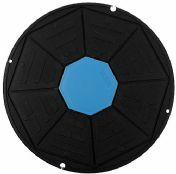 The Balance board can be adjust to 2 different level of difficulty with a simple move: in fact you only need to add or to remove a little ball of plastic under the Balance board to change the difficulty of the training. This adjustable difficulty level make the balance Board accessible to all people, beginner and expert.